Gilbert’s Potoroo is a relative of kangaroos but is way less common. Gilbert’s Potoroo is Australia’s most endangered mammal and the world’s most endangered marsupial. There are only 60 left! That is a sad claim to fame so we want to get them back off the edge so their cute eyes are what we focus on rather than their plight! There are three Potoroo species in Australia, all now threatened, but Gilbert’s Potoroo is the one in the most trouble. Potoroos are small kangaroo-like marsupials that hop around on their hind feet like kangaroos, but their forefeet have long claws to help them dig for their food. About the size of a rabbit, Gilbert’s Potoroo is the smallest of the three Potoroo species. Gilbert’s Potoroo is something of a food connoisseur having developed a very distinguished taste: 90% of its diet is truffles. The last wild Gilbert’s Potoroos live in only 1000 hectares on the windswept Mount Gardner headland at Two Peoples Bay, Western Australia. Two other populations have been created by scientists from the Two Peoples Bay Potoroo families. These homes have been set up in places where the Potoroos will be safe from foxes and cats – with one on Bald Island (1.5 km offshore) and one at Waychinicup National Park inside an 8-kilometre fox and cat-proof fence. Gilbert’s Potoroo was named after the explorer and biologist John Gilbert who travelled around Australia looking for new plants and animals and was the first scientist to find them, back in 1840. The Noongar people of the south-west already knew them well and called them Ngilgyte. In the mid-19th century Gilbert’s Potoroos were quite common along the south coast of Western Australia but were last seen by scientists in the 1870s and for a long time people thought they were extinct. It took another 120 years, until 1994, before they were found again. They know how to play a mean game of ‘Hide and Seek’. 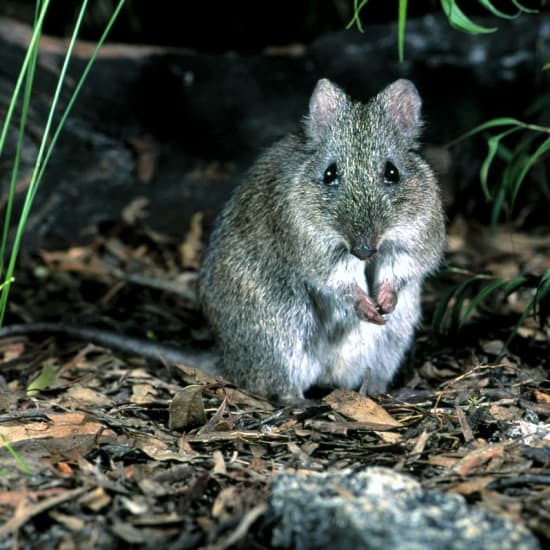 Gilbert’s Potoroos live in small groups in patches of dense, long unburnt shrubland on slopes around granite outcrops. When John Gilbert discovered them, he wrote that they were the ‘constant companion’ of the Quokka. Although not as social as their famous selfie-taking friends, they are just as cute but, because they live in thick bush in a remote place, they don’t get the same star-following as their mates. The main problems for the Potoroo are bushfire, being eaten by foxes and feral cats and the very small population which can make it hard for them to adapt to things like a disease or changes in their environment! In November 2015 a long-dreaded wildfire at Two Peoples Bay burnt 90% of the area where the Potoroos live . The fire didn’t leave enough vegetation to provide food or shelter from predators for the handful of survivors, so several were moved to another island to keep them safe while their habitat recovers. So you can see that Gilbert’s Potoroo is doubly impacted; not only do they struggle to find anywhere to live, but when these places get hit by bad stuff like bushfires or an influx of feral predators, there isn’t anywhere for them to go. The vision is to ensure Gilbert’s Potoroo can live without human intervention. But we know that this will take time and lots of work and help from you. $10,000 will upgrade flood-proofing and repair the feral animal exclusion fencing in Waychinicup National Park. This will help protect one of the precious insurance populations that are the reason we still have Gilbert’s Potoroo after the terrible bushfire at Two Peoples Bay. $100,000+ will enable the establishment of a new population of Gilbert's Potoroos including the selection of a new site, translocation and initial monitoring - either on the mainland or an offshore island. Since the habitat at Two Peoples Bay was destroyed by the fire, the need to find a fourth place for the Potoroos is urgent. Gilbert’s Potoroo Action Group is leading the community effort to help the Western Australian Department of Parks and Wildlife in their work to save Gilbert’s Potoroo. GPAG provides volunteer support for the fieldwork and funding for equipment while working hard to raise community awareness about the plight of the Potoroo. Donate directly to Gilbert's Potoroo Action Group.